The Mid Cheshire Line Community Rail Partnership working closely with the Friends of Littleborough Stations and Community Rail Lancashire along with support from the Association of Community Rail Partnerships and Women in Community Rail helped develop a new initiative, Discover Amazing Women by Rail. In-depth research was carried out on women who had done extraordinary things throughout their lives and who could be linked to a station and an attraction. Some stories were familiar, but many have been forgotten through time. The project aimed to bring light to these hidden histories, promoting them from local stations, encouraging people to have days out by train and allowing visitors to step into the footsteps of amazing women in places and attractions associated with them. It was also an opportunity to raise the profile of the Calder Valley Line and encourage people from Mid Cheshire and Calder Valley to have days out by train exploring further afield, capitalising on the Ordsall Chord linking Manchester Victoria with Manchester Piccadilly. Lemondrop Creative, a Chester based digital communications agency, were brought on board to illustrate the project. The Mid Cheshire Line (CRP) had previously worked with Nicky Thompson, owner and manager of Lemondrop Creative on the Marvellous Days Out campaign, launched in August 2017. 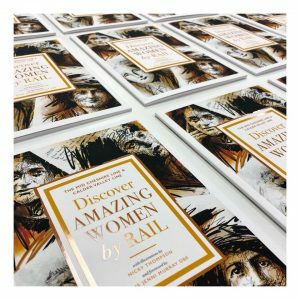 Discover Amazing Women by Rail is a sister project to the Marvellous Days Out campaign, drawing on its success but using different ideas to encourage people to take the train and enjoy marvellous days out. Both projects were made possible through funding provided by Northern (Seedcorn) and the Department for Transport (Designated Lines funding). The project consisted of a booklet and accompanying website showcasing how visitors can explore the area by rail and public transport whilst learning about historic women who had connections to the area. 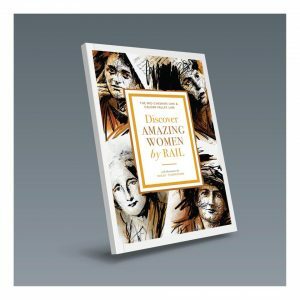 Discover Amazing Women by Rail was launched in March at Elizabeth Gaskell’s House, the former home of novelist and Cranford author Elizabeth Gaskell and one of the attractions in Discover Amazing Women by Rail. The launch was well attended by rail and tourism representatives and everyone enjoyed entertainment from a group of suffragettes (Friends of Wythenshawe Hall) and a band of inspiring female singers, Herizons. Since its launch this project has been incredibly successful. Positive feedback has been received from local tourism attractions, regional tourism organisations, local and national communities and members of the rail industry across the UK. A number of media outlets reporting on the project included Rail Magazine, Chester Chronicle, Halifax Courier, Rochdale Online, Knutsford Guardian, Cheshire Life, Lancashire magazine and national coverage through the Telegraph. The development of this project would not have been possible without the time, research and knowledge of volunteer Richard Lysons. This again shows how valuable volunteers are in community rail, and volunteers should not just be considered as a helping hand at a local station garden. Over 18,000 of the booklets have already been distributed to tourist attractions, libraries, stations and other places along both Mid Cheshire and Calder Valley Lines, and in East Lancashire with an additional 200 delivered to international delegates through Women’s International Networking conference in Manchester. Much of the feedback received from within the rail and community rail sector has praised how the project has set a new standard for rail tourism. Feedback from the attractions has been very positive too – they have high quality free booklets to hand out to their visitors, promoting the amazing women associated with them and supporting them in their work to encourage people to visit, spend their money locally and travel sustainably. Discover Amazing Women by Rail has led to other local partnership working including From Station to Station, an on-train and at station performance imagining conversations between some of the amazing women should they meet together in the 21st century. This was in collaboration with Knutsford Promenades for Heritage Open Days 2018 the theme for which was Extraordinary Women. Moving forward plans are being developed to ensure the continuation of the project’s success as well as encouraging other community rail partnerships to push the boundaries of tourism and leisure promotion.